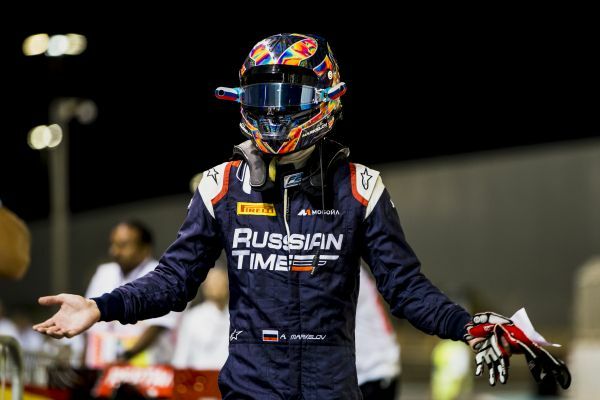 Artem Markelov finally claimed his maiden FIA Formula 2 Championship pole at the last round of the 2017 season at the Yas Marina Circuit, making good on the potential he has shown over much of the year to dominate this evening’s qualifying session, stopping the clocks on 1:47.181 to grab the top spot by two tenths from Nyck De Vries and Antonio Fuoco. The session got started under balmy evening conditions, with the lights blazing overhead as all of the drivers bar ART teammates Alexander Albon and Nobuharu Matsushita headed straight out on track. The times were soon tumbling as Alex Palou, Sergio Sette Camara and Norman Nato set the early competitive times, but Markelov soon blew past them all, annexing P1 by four tenths as most of the field returned to the pits and the ART and DAMS drivers (who had returned to the pits earlier) headed out to take advantage of the alternate strategy. The first 3 returned to the pits but the Thai driver stayed out to improve on his time, grabbing P2 next time round but soon stopping on track in the final sector as his rivals were re-emerging, with quick work by the marshals ensuring no yellow flags needed to be shown. Markelov led his rivals back on track, showing his eagerness to improve on his second set: with 3 minutes remaining they all hit their quick laps and the Russian improved further, with Fuoco slotting in behind him on the timesheets until De Vries crossed the line and stole P2 from the Italian but was unable to close the gap up to the front. Rowland put in a good, late lap to slot in behind the top 3 but ahead of Nato, Charles Leclerc, Luca Ghiotto, Matsushita, Sette Camara and Albon, setting up a fight for the teams’ title that should run to the line. Tomorrow evening’s feature race promises to as bright as the lights shining down upon it.